By analyzing the trails of 933 fishing vessels and more than 800 sharks and tunas in the northeast Pacific, researchers have identified regions where the two tend to overlap in a new study. While the ships could be traced back to 12 countries, most that operated within the high seas part of the study region belonged to just five countries: Taiwan, China, Japan, Mexico and the United States. Such fish-fishing overlap maps would be particularly useful for guiding fisheries management in the high seas, researchers say. Overfishing is rapidly pushing many of the world’s sharks and tunas toward extinction. The world’s fastest known shark, the shortfin mako, for example, was recently uplisted to endangered on the IUCN Red List, its decline mostly attributed to overfishing. A Pacific bluefin tuna. Image by aes256 via Wikimedia Commons (CC BY 2.1 jp). To find out where people fish, White and his colleagues relied on a massive data set of more than 70,000 industrial fishing vessels previously tracked in a 2018 study using the fleets’ automatic identification system (AIS). AIS is a tracking system that uses satellites and land-based receivers to monitor a ship’s location. For their current study, the researchers used a subset of this database, focusing on 933 industrial fishing vessels operating in the northeast Pacific Ocean. To find out where the sharks and tunas move in that part of the ocean, the researchers relied on data from Tagging of Pacific Predators (TOPP), a decade-long international research project that has tagged and followed some 22 marine species. White’s team used information from 876 electronic tags deployed on seven species — Pacific bluefin tuna (Thunnus orientalis), yellowfin tuna (Thunnus albacares), albacore tuna (Thunnus alalunga), great white shark (Carcharodon carcharias), shortfin mako shark (Isurus oxyrinchus), salmon shark (Lamna ditropis) and blue shark (Prionace glauca) — to predict each of their core habitats in the northeast Pacific. Except for the salmon shark, all the species are currently listed as threatened or near-threatened on the IUCN Red List. 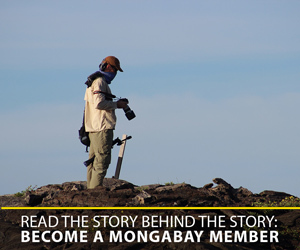 When it came to the fishing fleets, the team found an unexpected trend. While the 933 ships could be traced back to 12 countries, most of those operating within the high seas part of the study region belonged to just five nations: Taiwan, China, Japan, Mexico and the United States. When the team overlaid the fish and fishing data sets, they found that 4 to 35 percent of all the species’ core habitats overlapped with the range of commercial fishing ships. But where the two overlapped differed across species. 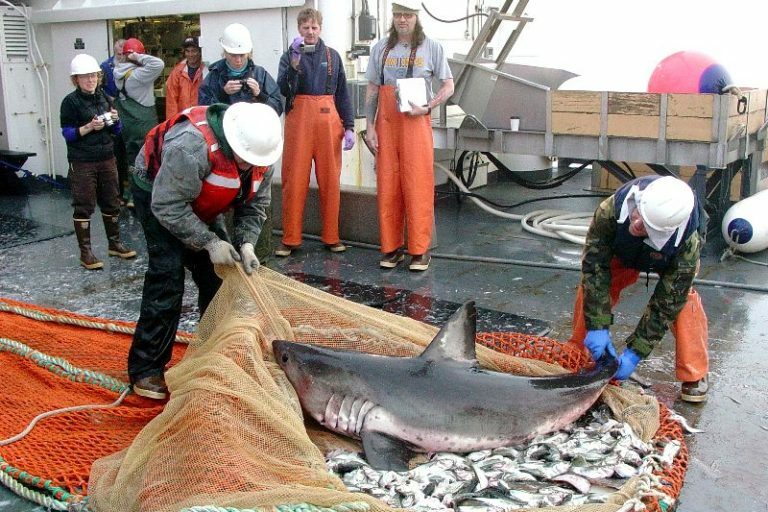 For example, while 94 percent of the fisheries-salmon shark overlap occurred within the exclusive economic zone (EEZ) or domestic waters of the U.S. and Canada, 87 percent of blue shark overlap occurred in the high seas. 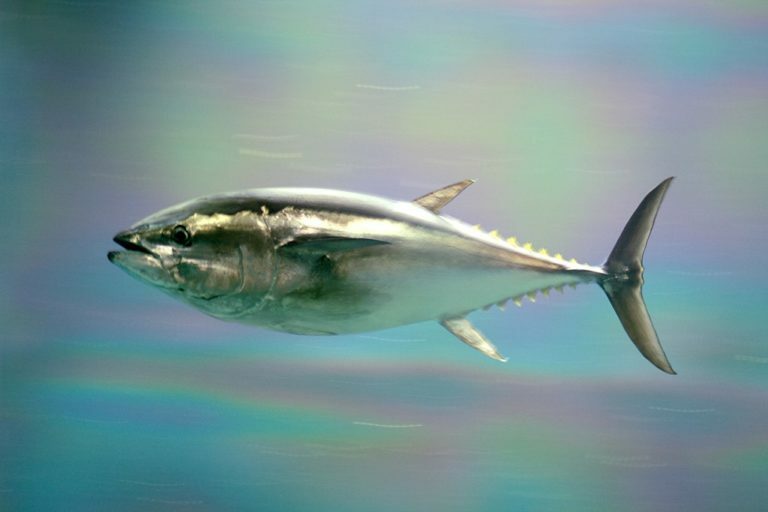 Overlaps of fishing vessels with Pacific bluefin tuna and albacore tuna, on the other hand, were more evenly distributed across EEZs and the high seas. A graph showing the contribution of countries to overlap in the high seas. Image courtesy of Timothy White. Charts of the study’s predicted overlap between industrial fishing efforts and core habitats for seven species of tunas, left, and pelagic sharks. Image courtesy of Timothy White. The study also identified some “coldspots” that had minimal overlap between fish and fishing: large marine protected areas. The authors acknowledge that “a species’ overlap with industrial fisheries is not necessarily equivalent to its catch rate or mortality,” since different fishing gear, such as trawlers, drifting longlines, or tuna purse seines, can affect species to different extents. However, identifying and reducing overlap between threatened species of fish and industrial fisheries is an “important step toward their global population recoveries.” Such maps would be particularly useful for guiding fisheries management in the high seas, researchers say. “Analyses like this open the door to conversations about whether we think that the current mode of operation in the high seas is most equitable, most effective and most desirable,” White added. A salmon shark caught in a trawl. Image by SST Kathy Hough via Wikimedia Commons (Public domain). Banner image of blue shark by Mark Conlin/NMFS via Wikimedia Commons (Public domain). White, T. D., Ferretti, F., Kroodsma, D. A., Hazen, E. L., Carlisle, A. B., Scales, K. L., … & Block, B. A. (2019). Predicted hotspots of overlap between highly migratory fishes and industrial fishing fleets in the northeast Pacific. Science Advances, 5(3), eaau3761.